When Christianity was spreading from the Middle East, the eastern Sicily as being placed “on the way” to the heart of the Roman Empire – Rome, was one of the first to embrace the new faith. No wonder that Syracuse – the prosperous and important city bridging East with West became one of the leading “underground” Christian centers. 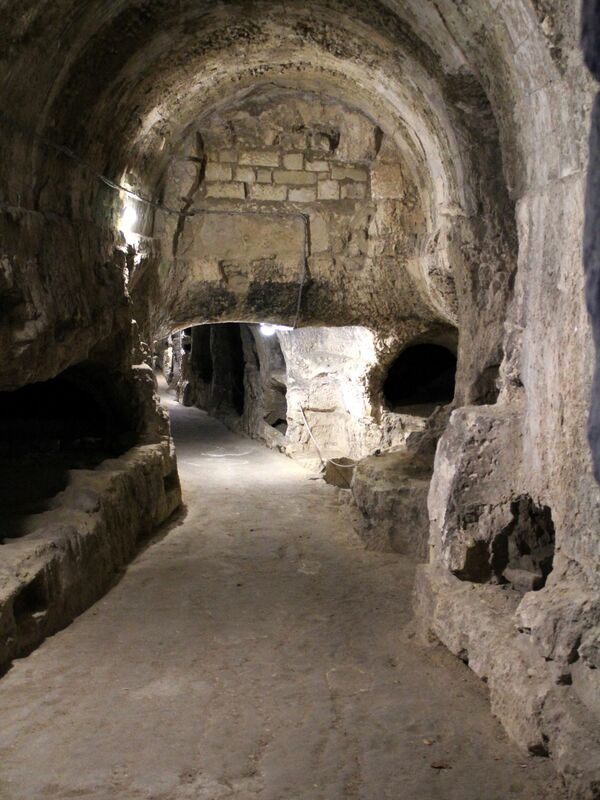 Early 2nd and 3nd century catacombs of Vigna Cassia and Santa Lucia represent clandestine cemeteries of Christian communities. The catacombs of San Giovanni (name derived from the Norman Basilica above) are quite different from mentioned burial sites. They were built after Emperor Constantine issued the Edict of Milan (313 AC), legalizing Christianity which actually became the official religion. 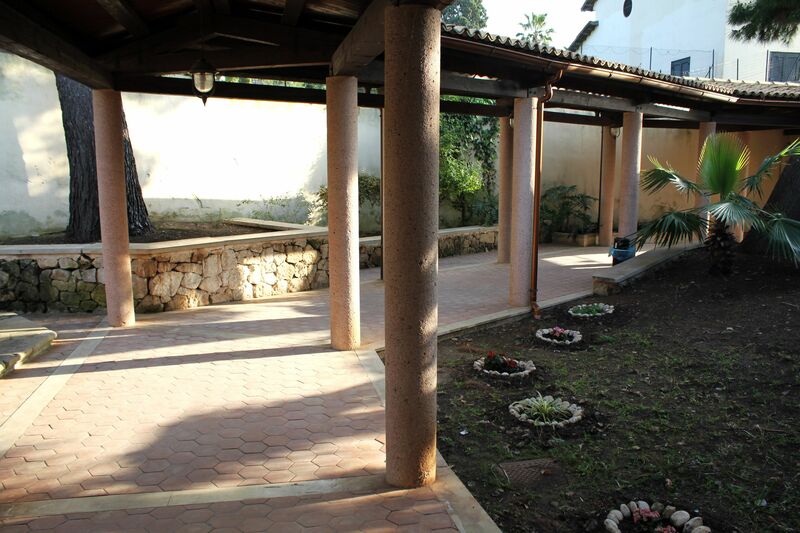 As the result, believers did not have to anymore hide their faith and tombs in underground catacombs. 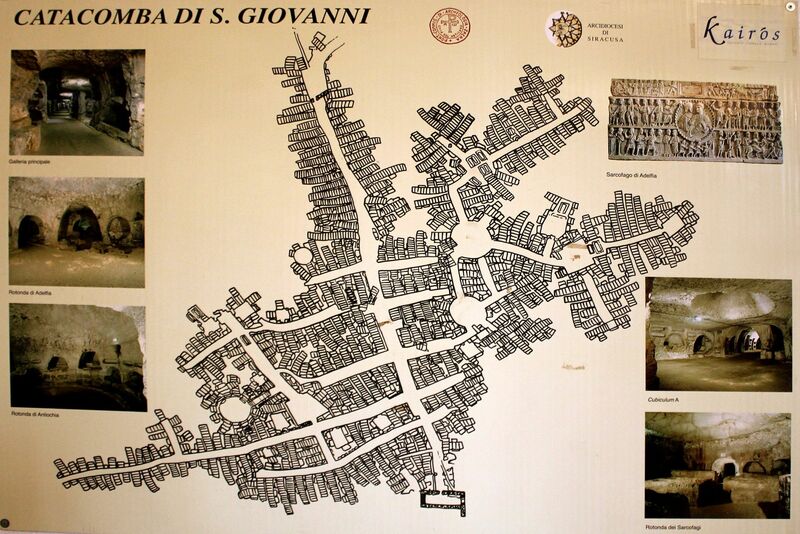 Catacombs were designed as a real city of dead with an elaborated plan. It is a huge complex (actually second largest after catacombs in Rome) with some 10,000 tombs honeycombed in niches along the main street and lateral galleries with numerous rotundas and chapels. The “designers” partially re-used pre-existing ancient Greek aqueducts and water cisterns adapting them to the needs of the burial site. The Crypt of San Marciano is the oldest part of catacombs and one of the oldest places of Christian worship in the western world. 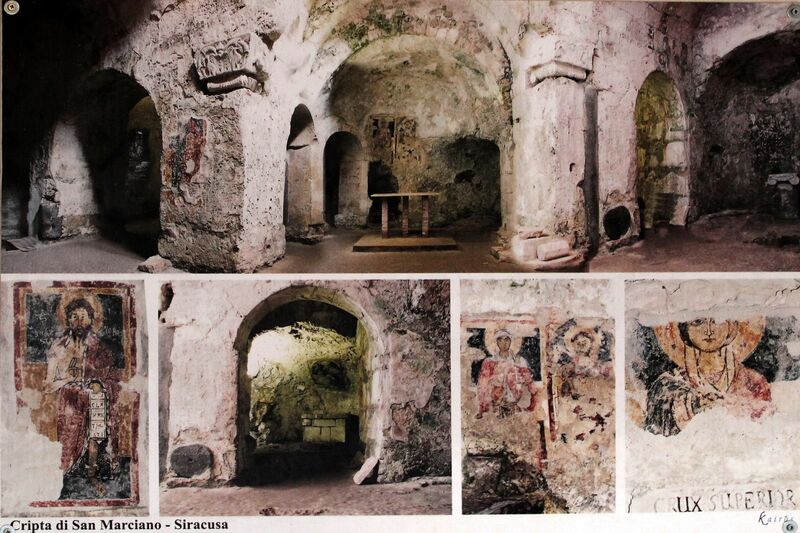 Located some 5 meters below the ground level, it is a burial place of the first bishop of the Christian community in Syracuse - San Marciano. It is also believed, that here for some time stayed St. Paul before departure to Rome. After legalization of Christianity (Byzantine times), the crypt was “remodeled” into a church. 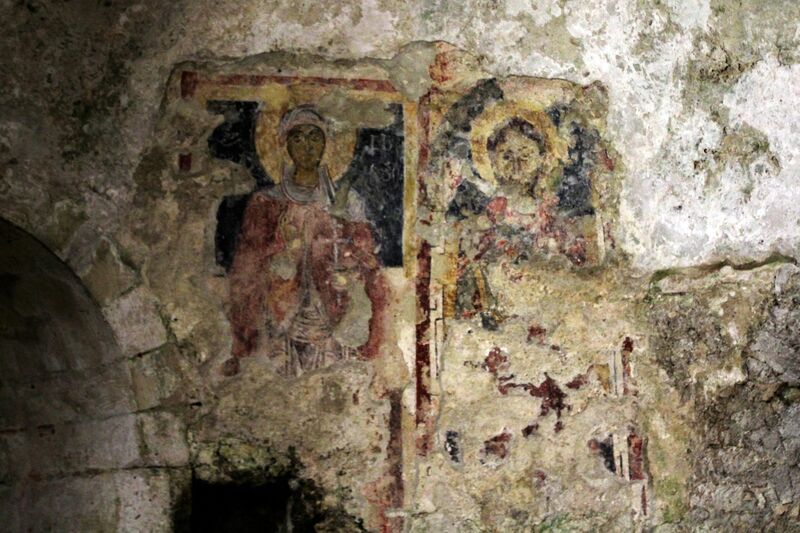 From those time you can still see remains of floor mosaics and faded-out frescoes of Santa Lucia as well as other saints including the patron of the crypt - Bishop Marciano. 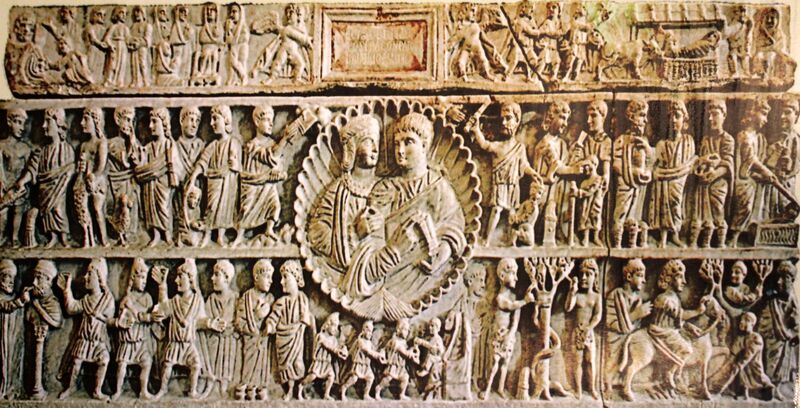 The most precious finding that made Catacombs of San Giovanni famous is the sarcophagus containing the body of a noble woman – Adelphia (as indicated by inscription – the wife of Count Valerious). The sarcophagus with beautiful bas-reliefs displaying scenes from the Old and New Testaments and at the center, the portrait of the couple was found in 1872. This discovery actually prompted to archeological studies of the site that were carried out from 1893 to 1909 revealing the catacombs in their current form. Unfortunately not much survived centuries of looting, this “very little” that outlived times is now displayed in the local museum (fortunately the sarcophagus of Adelphia was buried under the thick layer of earth escaping attention of looters).